Louisville's Ryan McMahon scored a career-high 24. LOUISVILLE, Ky. (AP) — No matter what line he shot from behind against No. 9 Michigan State, Louisville junior guard Ryan McMahon was feeling it. The Cardinals fed off his energy to not only give first-year coach Chris Mack a significant win, but a gutsy one at that. McMahon made two free throws with 7.1 seconds remaining in overtime before Jordan Nwora made another from the line with 3.1 seconds left to seal it as Louisville upset the Spartans 82-78 on Tuesday night in the ACC/Big Ten Challenge. McMahon scored all seven of his points in the extra session from the foul line to finish with a career-high 24. Highlighting that total was 12-of-13 free throw shooting and four 3-pointers to top his previous best of 15 points last tied in January against Pittsburgh. He missed his one 2-point attempt, but that was forgotten as he converted frequent opportunities at the line. Nwora’s clinching free throw followed his 3-pointer with 2:05 left that gave the Cardinals (4-2) the lead for good in an exciting matchup that ended a two-game slide and followed a 77-74 loss to Marquette in OT on Friday in Brooklyn, New York. This one didn’t slip away. Louisville needed just about every point to hold off the Spartans (5-2), who had a chance to get close with Joshua Langford (15 points) at the line. But he missed the first of two free throws with 4.2 seconds left and failed to hit the rim on an intentional miss, a violation that gave Louisville the ball and led to Nwora’s free throw. Dwayne Sutton and Christen Cunningham each had 13 points for the Cardinals, who won despite shooting 40 percent and getting outrebounded 47-30. Kyle Ahrens had 15 points for Michigan State while starting in place of injured senior guard Matt McQuaid, who did not travel for the game because of a thigh bruise. Nick Ward had 14 points and Cassius Winston 13, while Kenny Goins grabbed a career-high 17 rebounds. Izzo said McQuaid would be evaluated daily after hurting his thigh late in the win over Texas. He said it began swelling on the plane ride back from the Las Vegas Invitational and just needs to subside. Michigan State could fall out of the Top 10 after losing to an unranked team. 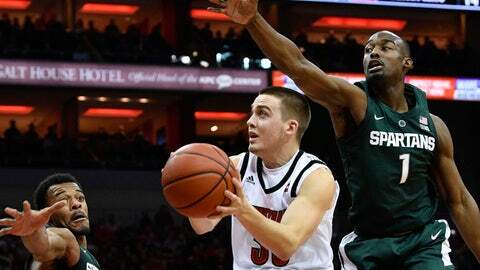 Michigan State: The Spartans fought hard despite missing shots and committing turnovers in the first half. Langford provided a big lift down the stretch in regulation and overtime but missed a free throw that could have given the Spartans a chance. Louisville: The Cardinals led much of the game before wobbling down the stretch. But they regrouped in OT, dictated the pace and made free throws, most importantly. Michigan State opens Big Ten play Friday at Rutgers before hosting Iowa in another league game on Monday. Louisville visits Seton Hall on Saturday in a matchup of former Big East Conference foes.